Found in Bugabula County, Buyende District in eastern Uganda, Kagulu Hill is a new attraction on Uganda’s adventure menu. It towers high and from a distance, there are noticeable engagements on it. As you come closer, you will see people, mostly children almost painlessly running up and down, a fete that the elderly and unfit can only resent. 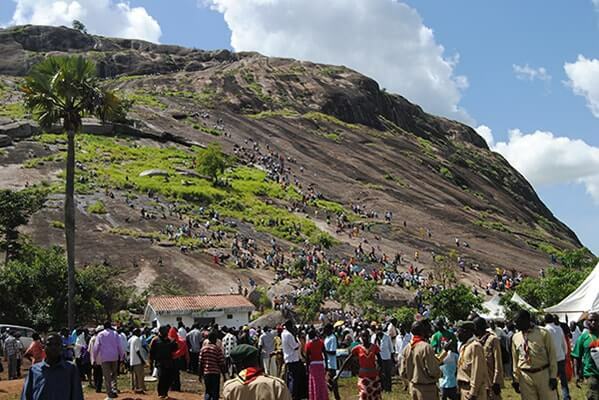 The solid rock part of Uganda Tourists attractions found in Busoga region is easily toured by travellers visiting Jinja or going and coming from Mount Elgon National Park in eastern Uganda. At the hill, there are two points at which one may hike the rock, one to the northern side and the other to the southern side where there are some climbing metallic steps. Although it is no mean bazaar to hit to the peak, it is worth the attempt. When climbing the hill, it’s a moment when one’s physical energies and patience are tested. Many rock climbers are always saturated in sweat by when they ascend to the summit. Kagulu climbing is such an exceptional experience and a fitness adventure. When you get to the top of the hill, you can view the striking waterfalls rolling from the top of the rocks, the antique caves and Lake Kyoga at a convergence with River Nile. The rock is not only prominent for its altitude and the task it offers to its climbers, but it also has caves that offered residence to the long ago inhabitants of the area. It is said that the Bunyoro kings tried to find sanctuary and took their leisureliness on this hill. It is further alleged that the caves were exposed around 1686 during the reign of King Olimi of Bunyoro. It is asserted that Prince Mukama was among the first Bunyoro cultural monarch to conquer and triumph over Busoga, facilitating the settlement in the caves on the rock. The hill caves are found at the foot of the hill and one can use it as shelter from sunlight in this portion of eastern Uganda that has few trees. Once at the top of the rock, you will be pleased with panoramic decors of Busoga at an eagle eye’s observation places beyond. There is a small house that offers shelter from the sun though the elevation breeze is soothing plentifully.